Habitat: The species is native to Europe, western Asia, and North Africa. It was introduced early on in North America, where it soon became naturalized and formed natural hybrids with white avens (Geum canadense). Wood avens grows well in shady deciduous forests, along forest edges and near hedgerows, but it also thrives in landfills and other man-made areas such as parks and gardens. Wood avens is easy to grow. The plant likes full sun and does not make many demands on the soil composition. The plant is propagated with seeds, or by root division. Description: Wood avens is a perennial plant belonging to the rose family (Rosaceae) with coarse, dark and clove-like fragrant rhizome. It can reach a height between 30-70 cm with erect stem covered with soft, gray-white hair. The leaves are alternate, pinnate and usually three-lobed. The bright yellow flowers have five petals and appear between May and August. The flowers are hermaphrodite (have both male and female organs) and are pollinated by bees. The fruit is an achene (small fruit containing a single seed) with hooked hairs or burrs for attaching to animals in order to spread. Plant Parts Used: It is both the rhizome and the aerial parts of the plant that are used in herbal medicine. The rhizomes are collected in the spring when they are richest in essential oil and used in decoction or liquid extracts. The aerial parts should be gathered in July when the plant is in full bloom. Today, the herb is mainly collected from the wild in eastern and southeastern Europe for commercial use. The rhizomes of wood avens are often used as a substitute for cloves (unopened flower buds of the clove tree) because they smell and taste very similar. The cloves-like scent is due to a glycoside which if added to water converts to eugenol. Eugenol is a strong fragrant substance which is also found in cloves. In moderate amounts, eugenol has bactericidal, sedative and mildly anesthetic properties but in larger doses, it will irritate the mucous membranes and cause dizziness. The content of eugenol in wood avens is so small that it does not cause any side effects. Active Ingredient and Substances: The plant contains tannins (up to 30%). These consist of various complex gallo- and ellagi-tannins (gemin A, D, pedunculagin, sanguiin H-6) and condensed catechol-type tannins, together with phenolic acids (caffeic acid, chlorogenin, ellagic acid, gallic acid, and protocatechuic acid). The herb contains small quantities of an essential oil with eugenol as the main component and myrtenal as a minor component. Furthermore, it contains bitter substances, glucose and sesquiterpene lactone (cnicin). Because of the herb’s content of bitter substances, it had a reputation as a medicinal plant already in classical antiquity. In the 1100s Hildegard of Bingen, a German Benedictine abbess, writer, composer, and philosopher, nicknamed the plant “benedicta”, which means “the blessed”. In folklore, wood avens was credited with the power to keep the devil at bay and protect against evil spirits. Due to this belief, the herb was often worn as an amulet or stored in homes and other buildings. It was also believed that the herb could offer protection against rabid dogs and snakebites. 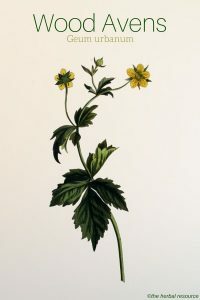 Wood avens has been associated with Christianity because of its three-lobed leaves and its five flower petals, representing the Holy Trinity and the Five Wounds of Jesus Christ. In astrology, the herb is believed to be ruled by Jupiter. The strong astringent properties of the tannins present in wood avens combined with other substances could make the herb helpful as an herbal remedy for many ailments associated with the digestive system, such as diarrhea, dysentery, peptic ulcers, ulcerative colitis, Crohn’s disease and other similar inflammatory bowel diseases (IBD). The herb is regarded to be useful in reducing nausea and prevent vomiting. The bitter substances stimulate appetite and trigger gastric secretion and bowel movements, while the essential oil in the rhizome has antispasmodic action and inhibits gas formation. In addition, these bitter substances may also act as regulators of sorts in the function of the liver and gallbladder. The astringent effect of wood avens also explains its traditional uses as a gargle or mouthwash to treat a sore throat and bad breath. As an herbal wash the herb can be used for vaginal discharge and in the form of lotion or ointment, it can be used as a relief for hemorrhoids. Wood avens does have a sedative effect and may be used in the same manner as valerian (Valeriana officinalis). The effect, however, is much weaker. Furthermore, the herb is regarded to be helpful as a treatment for high fevers and it has sometimes been used as a substitute for quinine. It has also be used to relieve chronic bronchitis and in folk medicine, the herb has been used as a remedy for a toothache. In the 16th-century, wood avens was a common kitchen herb in Central Europe and was often grown in herb gardens. The fresh leaves give a slight but pleasant flavor to salads, soups, and stews, while the ground rhizome can be used as a substitute for cloves as a spice for soups and broths. The root has also been used as a flavoring agent in beer, wine, schnapps, and liqueurs. in the past, wood avens was often placed in closets and other storage containers for fabrics and clothes to get rid of moths. As a tea: Add ½-1 teaspoon of the crushed root in a cup of cold water, then boil and simmer for 5 minutes. Three cups per day can be consumed for therapeutic purposes. The tea can also be used as a mouthwash or a gargle. As a tincture: 1-3 mL in half a glass of water three times daily. 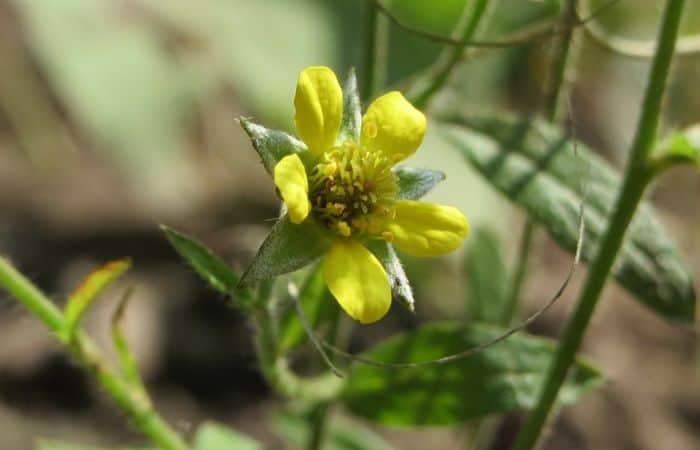 Because of the high tannin content and the lack of data concerning the possible toxic effect of the herb, wood avens should not be used in excessive doses or for a long period of time. The herb has been known to affect the menstrual cycle and should be avoided during pregnancy.